Sunday is the day — and dawn is the time of day — that the noise of Chicago’s elevated train gives us urbanites a much-needed respite. It’s also before the rest of the typical city noise has a chance to build up a head of steam. I like to use this time to commune with the small slice of nature I’ve carved out for myself. To let my thoughts drift to that happy place and to realize that there is renewal in every unfolding petal. My moment of Zen, if you will. And as garden blogger Steph notes, morning in general is also a good time to survey your plants. 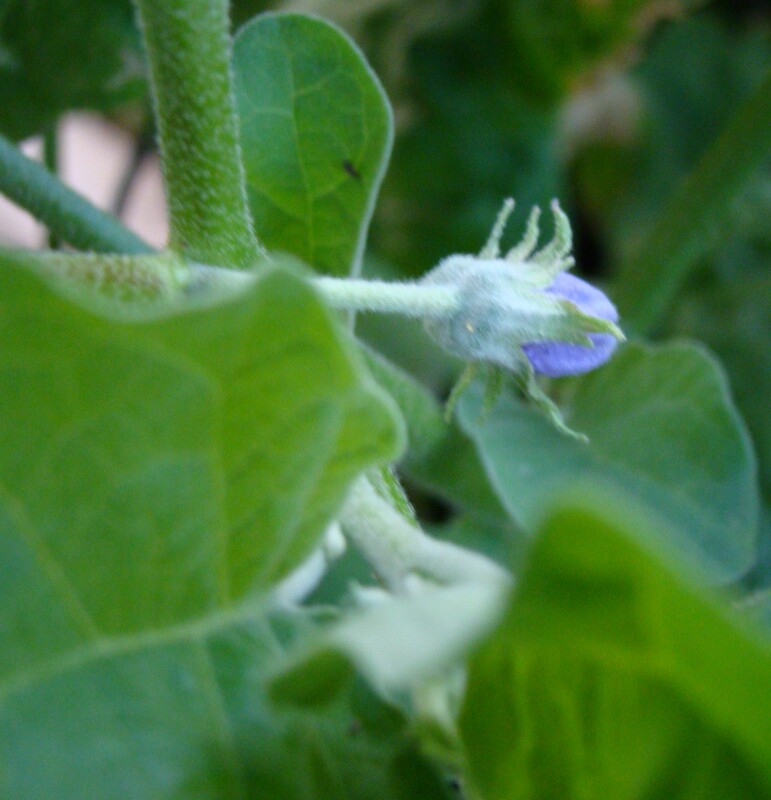 To discover that the flower buds on my sole veggie experiment (top photo, feel free to have a guess at what it is…), not counting my jalapeno, are a provocative purple. Speaking of my jalapeno, thus far there is one pepper and lots more buds and flowers. 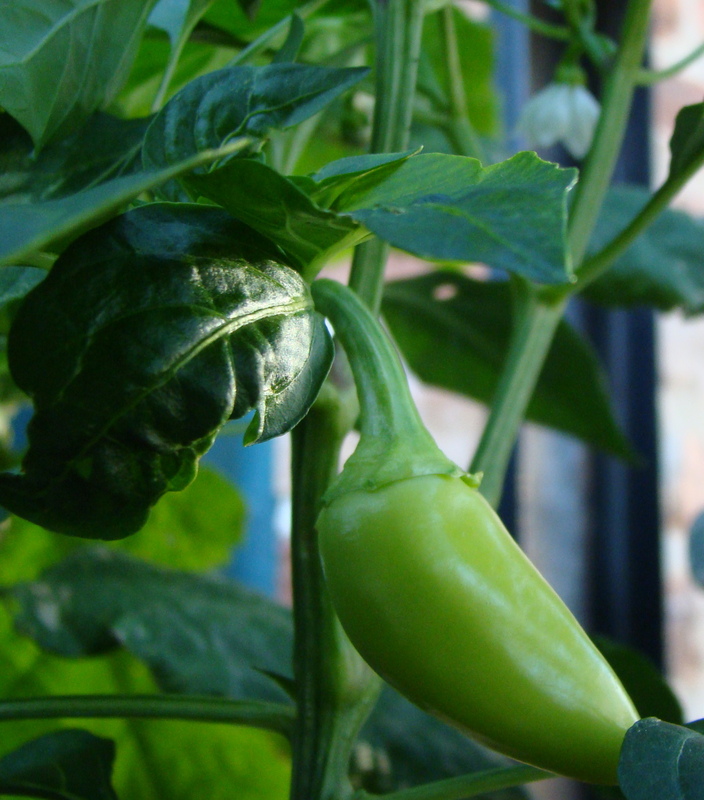 Remember, I planted a jalora jalapeno this year, so it’s not ready to pick until all the green has given way to yellow. But, it’s not all sunshine and light (or the brink thereof). What I mean is, not all my plants are robust and full of promise. One of my heirloom tomatoes is suddenly looking anemic, and the morning glory is leafy, but not yet covered with the blooms that should be greeting me this time of day. I love Anna Qundlen, always loved her column in the Trib, and have read her Short Guide to a Happy Life numerous times as well. I do often bring a book out with me to read, but seldom get very far, as the garden and the early-morning light usually have me fairly transfixed and too distracted for much reading. Hmmm. 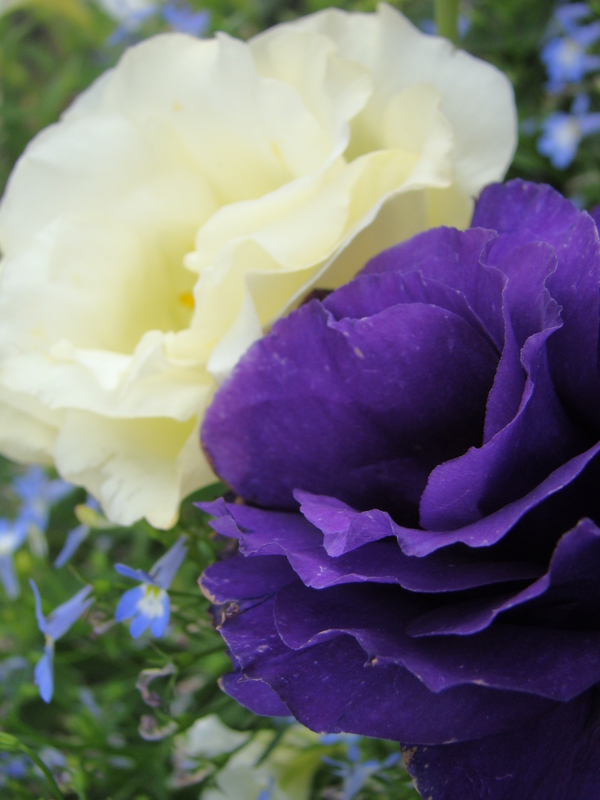 . . the only veggies I can think of with blue blooms are nightshades – eggplant, and some varieties of potatoes and sweet potatoes. It hasn’t been a banner year for tomatoes, still I hope yours bounces back. Linda, I guess the garage band is one type noise we don’t have to contend with in a city condo. I feel for you 😉 Your i.d. powers are strong! It is an eggplant. More to come in a later post when it matures. Early mornings certainly are peaceful, and a lovely time of day to be at one with nature. Yes, I was going to guess at aubergine (eggplant). I recognise the leaves from the aubergines I have grown this year. I love early morning, whether I am on my terrace at our condo in Toronto (no noise from the bar next door at 5:30 am) or in my garden at my house in Owen Sound (and no neighbours up at that time of morning to catch me in my nightie). Everything is so fresh and perky (including me) before the heat of the day arrives. For me, it is the perfect time of day! What a wonderful post! I wholeheartedly agree with you as well, early morning IS the time to commune with nature in your own garden world. I enjoy nothing more than to take an early morning stroll along the grass paths we’ve created in “Our Eden” and marvel at the beauty of nature, all the while knowing that I had a part in bringing it to life. Such a marvelous feeling, the serenity of it all.